Of all of the things in the woods to fear, I never thought a nocturnal songbird would be at the top of my list. Yet here we are. 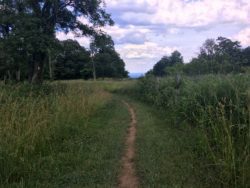 On my first night in the Shenandoah, we were cursed with listening to the Whip Poor Will all night long. There were probably about three, and between each of them there was not a single moment of silence. They took it in turns to torture the hikers that had the misfortune of stopping at Blackrock Hut for the night. Picture this: you nestle down into your sleeping bag at the end of a long day of hiking. Your feet are sore, your body tired, but you’re happy to finally be going to bed. Just as you close your eyes you hear the call, “whip, poor WILL! 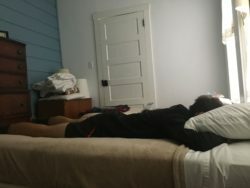 Whip, poor WILL!” You groan, exasperated, knowing you’ll be listening to it all night, knowing that sleep may never come. You attempt to cover your ears with your clothing bag as your soul itself starts to weep hopelessly. That is how the Whip Poor Will breaks your body and shatters your spirit. This is a bear pole. All the practice hanging flower baskets at work is paying off. We have declared the Whip Poor Will to be public enemy #1. Inasias at one point crawled out of her tent in the night and started hazily throwing rocks aimlessly into the woods to no avail. I would easily call this my worst night of sleep on the trail, rivaled only by the nights in Georgia when I was sick. 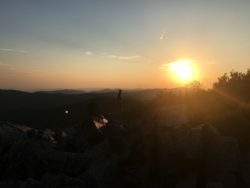 We woke up after the worst night of sleep at 4 in the morning to catch the sunrise at Blackrock summit. It was lovely, and I’m so glad we got a clear day. Morning hiking became a luxury disguised as extra work. It’s been getting hotter and hotter as we get further into summer, so the cool mornings are a treat. The Shenandoah’s have some great hiking, but I am not, and have never been, an fan of the heat. The best part about song association football is that it’s not competitive. There are no winners or losers, and everyone can sing along to everyone else’s songs. We also finally discovered something that Nemo is bad at: singing. At first he wouldn’t even play, but then I think he realized how much fun the rest of us were having. We earned the trail family name “The Quartet” because we were always singing while hiking. Despite my extensive background in hiking, I have never seen a bear before. The one time that my mom went hiking with my brothers and not me, they saw three bears, a mother and her two cubs. Of course. So when Nemo, Peregrine, and Inasias told me they had seen two bears the one morning I decided to hike alone, I was not shocked. Clearly some forces were working against me, I was just never going to see a bear. The Shenandoahs are the reason why people say Virginia is flat. The very next day, as I crested a hill I heard something walking towards me. 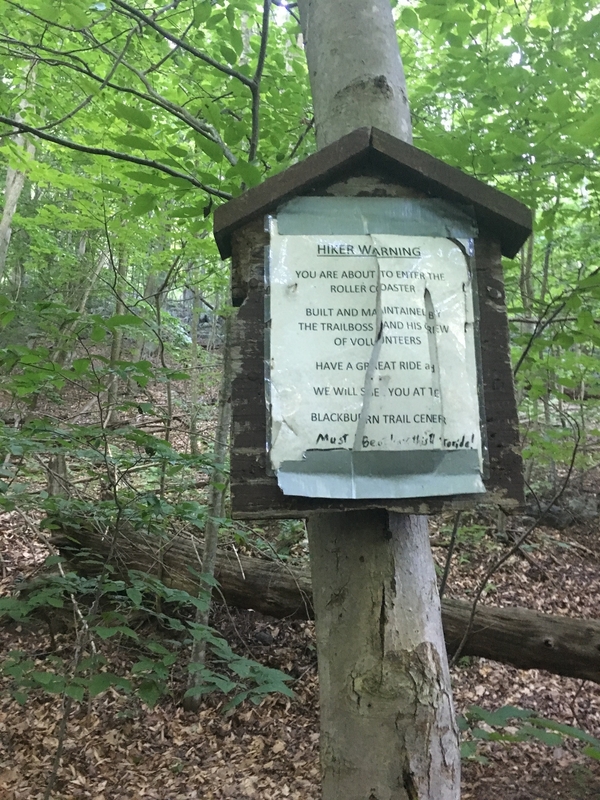 I looked up, expecting to see another hiker, and was shocked to see a fuzzy black creature not ten feet from me in the trail. There was a brief moment where we made eye contact. I said, *gasp* “oh my gosh! A bear!” To which the bear responded, *gasp* “oh my gosh! A human!” It then proceeded to run off into the woods, and I proceeded to hyperventilate for a solid 30 seconds. This was the first of three bear encounters I had in the Shenandoah. They all ended in the same fashion. I saw bear, bear saw me, bear ran away. Therefore, I have no good pictures. To everyone who was worried about bears when I started the trail, please stop worrying. Bears are much less scary than Whip Poor Wills. At the very least, they’re misunderstood. 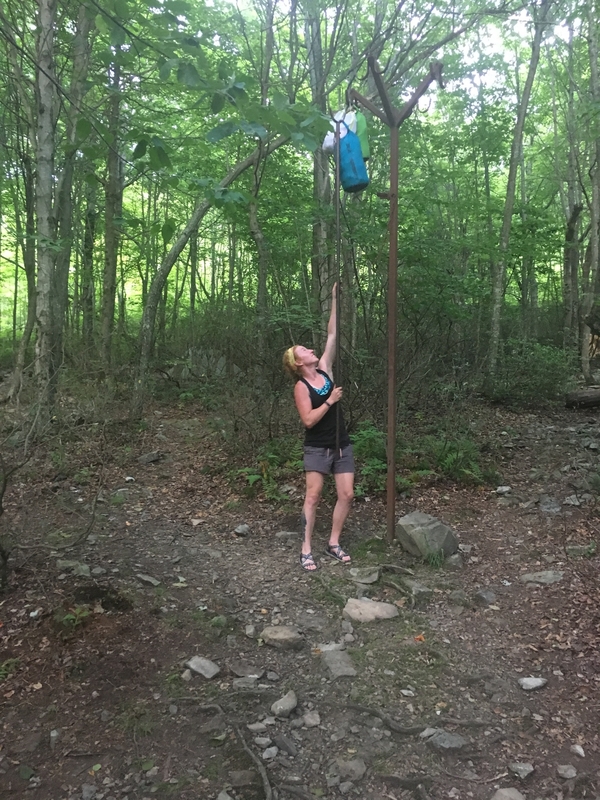 Bears on the AT are really only dangerous if they have cubs, you decided to run from them, and/or you don’t store your food properly at night. They’re just trying to survive, just like us. 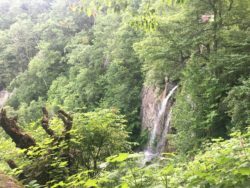 The Shenandoah is not just big trees and pretty views. Oh no, it has much more than that. Strategically placed throughout the trail there are these little places called waysides. If you timed it right, you could get to one each day. Basically, a wayside is a little tourist mecca where they sell food, drinks, snacks, and other goodies. They also have real, working toilets, and sinks with running water. 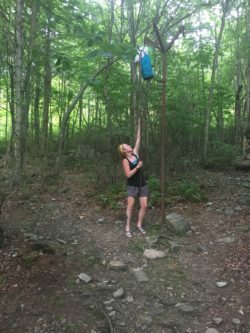 Inasias mistook a tourist for a thru hiker once because they were washing themselves in the bathroom sink. Turns out, they had just stumbled across some poison oak. I would shower in the closest sink too. We took full advantage of waysides, treating ourselves to hot food almost every day. I highly recommend the blackberry milkshakes. To be honest I was skeptical at first, but mmm those things are delicious. Also, with it being so hot, cold beverages were like nectar of the gods. We lost Nemo right around the time we got to Skyland Resort, the biggest and bestest of all the waysides (actually it might not technically be a wayside). He sprouted some wings and flew to Front Royal, so the Quartet became the Triad. 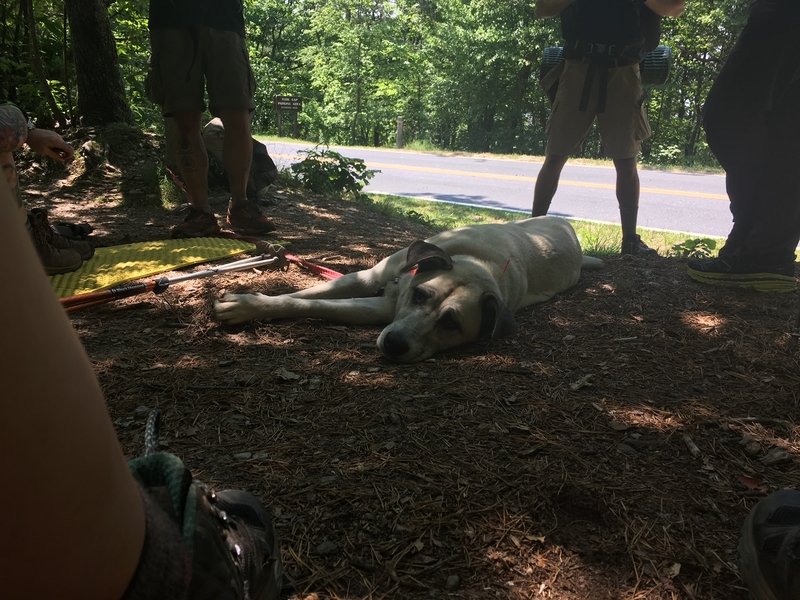 Morale of the story: waysides are the bomb, and a great way to motivate yourself to get through a day. So you’ve probably figured out by now that I really like the Shenandoah’s. 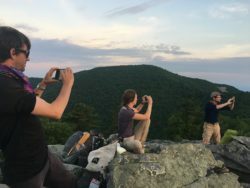 I was hiking with people that I enjoy, eating cooked food frequently, viewing sunrises, covering miles, seeing bears, and breathing the clean fresh air of Virginia. Aside from the heat, I really had no complaints. On our last night in the park, I met someone who had the complete opposite view from me. This guy had something bad to say about everything. If all of the negativity on the trail could be concentrated into one person, this would be it. Everything was “trash,” particularly the Shenandoahs as a whole, and Naked juice. Mind you, he says this to me as I am sitting in this gorgeous park, drinking my Naked juice that I had taken great care to pack out from a wayside. My entire life I have been told I will never get along with everyone I meet, and this fellow was a shining example. It was clear that his mind would not be changed on the subject, and there was no way he was changing mine either. If he wanted to be miserable, fine. That doesn’t make it ok for him to bring everyone else down. I’ve gotten really good at removing myself from these situations. It’s not worth my time to try to change someones opinion. Live and let live. Inasias and Peregrine are quite possibly the most entertaining people to hike with. We keep our minds occupied by making up stories, playing games, and creating a 21st century playlist of cheesy music for Nemo. We also managed to write a parody on the Lion King’s “I Just Can’t Wait to be King” called “I Just Can’t Wait to be Clean” (I was really excited about taking a shower that day). Just to clarify, I don’t actually like kale. At all. This guy was so excited about his kale milkshakes though, I couldn’t say no. 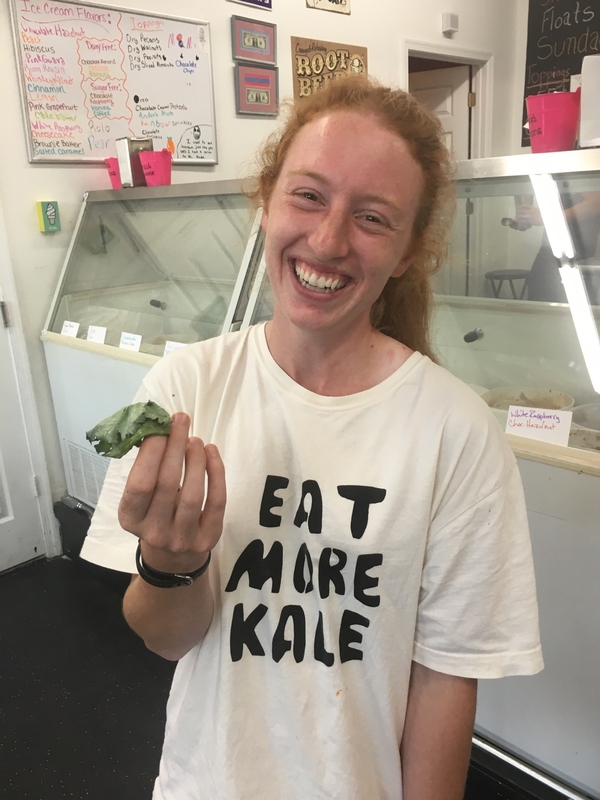 So I ate the kale, and he was quite pleased. Peregrine ordered a “free side of harassment” with his ice cream too, which got the guy even more excited. 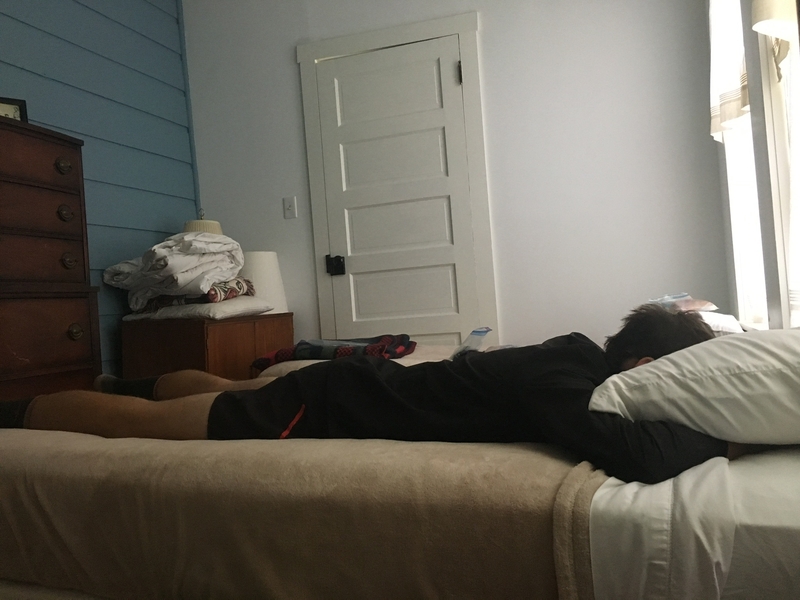 The whole trip was very entertaining. I highly recommend this place, C&C Frozen Treats, because the people that work there are a hoot and clearly take pride in what they do. 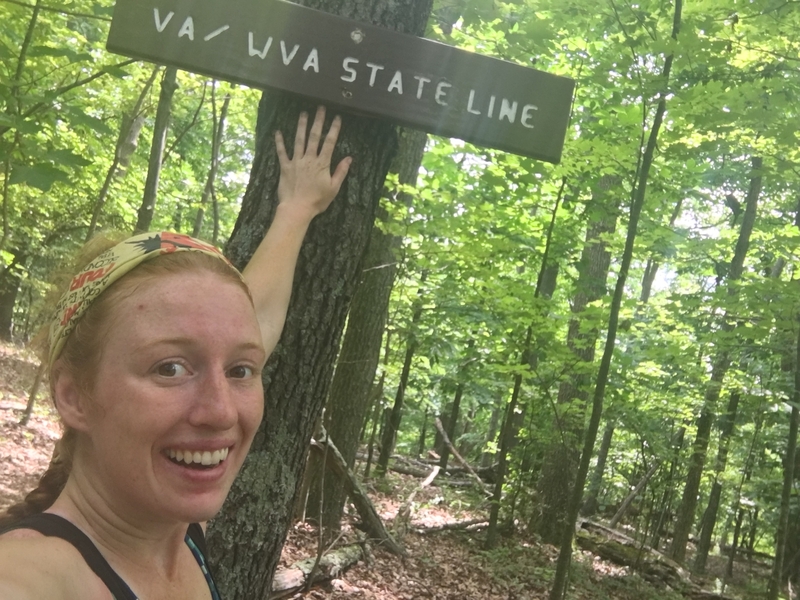 It’s almost as if Virginia really wanted to make a point with the last few miles we hiked in it. As you leave, your parting gift is the Roller Coaster. In my mind, this is Virginia saying “Hey, by the way, I’M NOT FLAT.” The Roller Coaster is a 13.5 mile stretch of numerous, very steep, ups and downs. Don’t you worry Virginia, you’ll always be hilly to me. I see so many people talking and writing about “The Virginia Blues.” I’m sure that their complaints have some personal merit, however my experience was not the same. I loved Virginia. It was not, by any stretch of the imagination, flat or easy. The trail was never supposed to be easy. I always knew going into this that I would struggle. Virginia, however, was amazing. I couldn’t go through all of the cool things here and not love it. 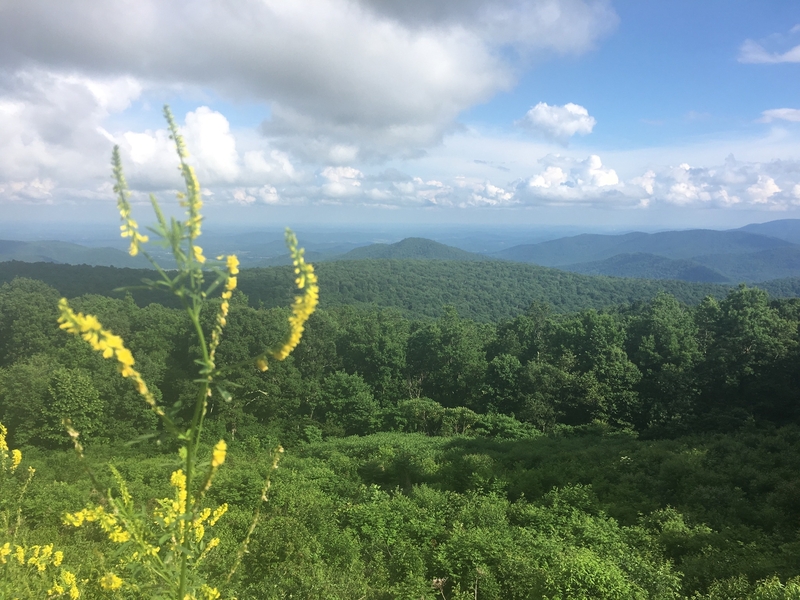 Grayson Highlands, the Virginia Triple Crown, the Priest, the Shenandoah’s, Trail Days, the Virginia Creeper Trail, and everything in the between. Maybe most hikers suffer from the Virginia Blues, but I was lucky enough to escape unscathed. I came away from this state feeling more excited and invigorated about my hike than ever before. How can I not completely love this life? Every day I wake up and walk through some of the most beautiful places on earth. Smell the roses, breath the clean air, eat the blueberries. Just make sure they’re actually blueberries and not something poisonous. As I leave Virginia and march on to the mental halfway point, Harper’s Ferry, I’m more excited than ever before. The count up has turned to a count down. 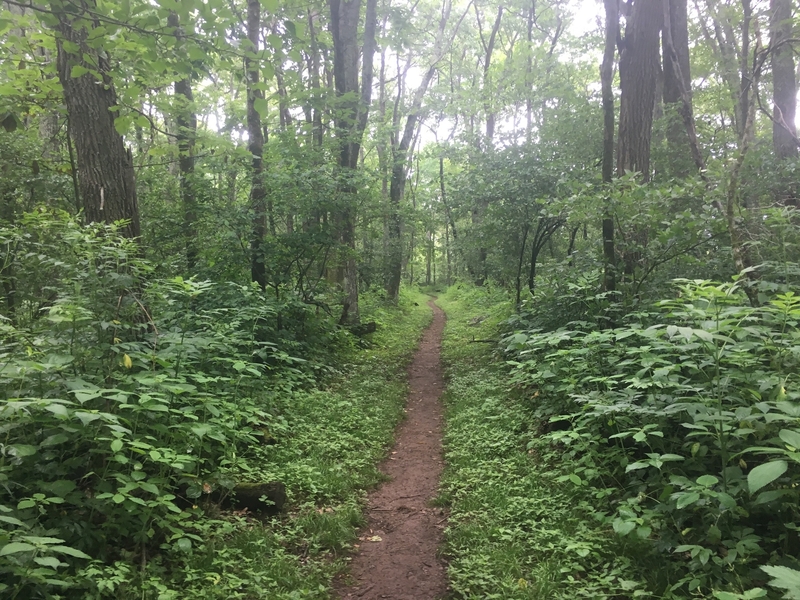 I’m really doing it, I’m really hiking the freaking Appalachian Trail. 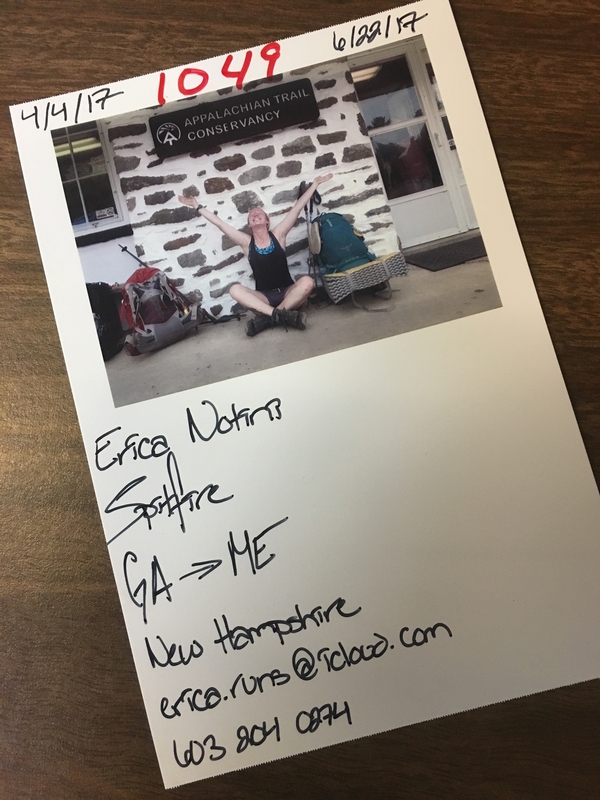 If you care to, you can follow along on instagram at erica.runs or shoot me an email at [email protected]! 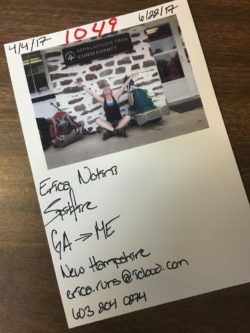 2017 AT Thru Hiker and outdoor enthusiast, I have been hiking in and around the White Mountains of NH since I was 6 with my mom and brothers. 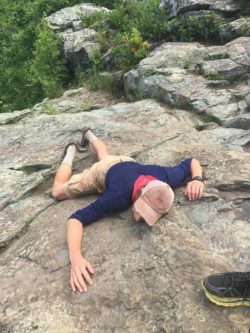 After finishing the AT, I pursued my goal of spending my life outside by becoming a guide for a wilderness therapy program. 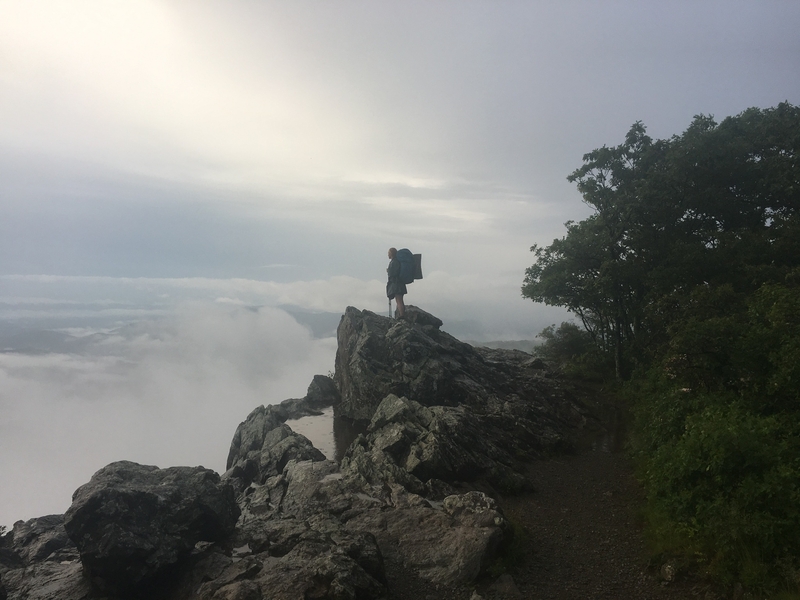 Despite living in the woods for a living, the lure of thru hiking has persisted. Stay tuned for more adventures to come! Really enjoyed this post as I’ll be hiking SNP late this summer with family. A very positive and entertaining post. congrats on making it to the halfway point if your thru hike. Looking forward to your future posts. I laughed all the way through your post and read many parts to my wife. 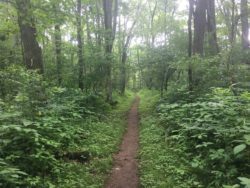 We loved the Shenandoah’s waysides and ate our way through them too. Keep having fun. My first time at Black Rock a “devil bird” sat on the fire pit & called all night. I tried to warn those staying in the shelter this year, they thought I was kidding! They don’t think that anymore!! Good story, I love SNP! Thanks for the memories! First time was 20+ years ago, so prolly a different bird this year. I slept well away & had earplugs in before the “concert”.